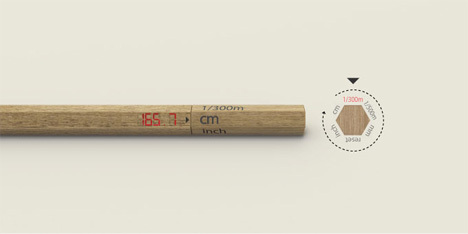 The Free Form Ruler takes an annoying element of science and design and turns it into something rather fun. That something annoying, of course, is trying to measure distances on paper – and the fun part of this design is that the ruler measures just by drawing a line. Making sketches or tracing over existing sketches becomes a simple way of figuring out short distances. The pen’s measurement units can easily be changed by twisting the top part of the device. Five different units of measurement are represented in the cool, futuristic gadget along with a “reset” function. A simple LED display shines through the wood veneer to give the readout on whatever was just measured. Of course, the ruler would not be applicable in every situation, but it is a fun departure from the regular plastic or metal sticks that we usually use to measure small distances. The design was created by South Korean design group Monocomplex. See more in Futuristic or under Technology. April, 2011.